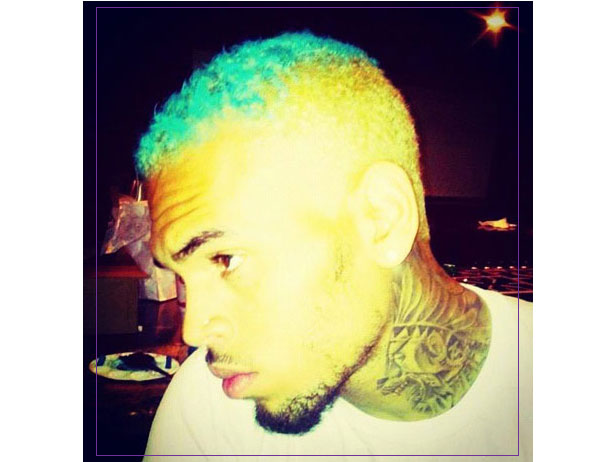 KayKiSpeaks.com: Chris Brown Dyes Hair BLUE & gets new ink! Chris Brown is always up to something! This photo made it's way to his instagram account last night shortly after his tattoo artist revealed he was getting a little more ink. The multifaceted artist has changed up his hair color for the moment. Keeping the blond around the edges, Chris has dyed the top a really bright blue! While some fans made fun of the singer turned rapper, others loved the photo and his new hair color! He's got a lot of nerve to do this, but dare I say- it is working for him!!!!! Chris is just wrapping up his video shoot for the next single from FORTUNE, a ballad entitled Dont Judge Me. 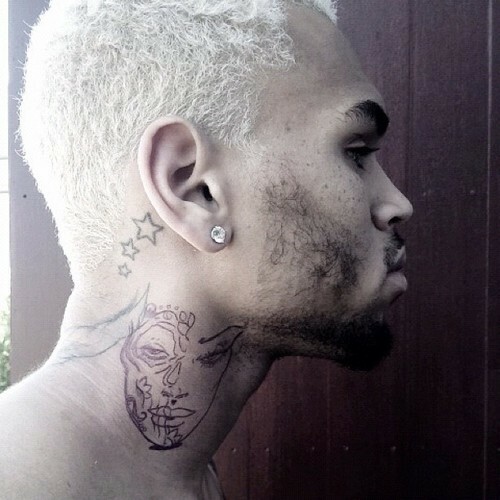 As stated Chris also got started on a new tattoo yesterday- this one on the right side of his neck. It is in it's beginning stages according to Chris' tattoo artist Peter Koskela- but it depicts the face of a woman as seen below. Chris just got the tattoo seen in the first pic on the left side of his neck not too long ago. Chris may be going for the fully tatted rocker look. What yall think about his expressive image?! i love his hair like that!